Last week I went to the Alaska Marine Science Symposium 2017 meetings in Anchorage. I’ve never gone to those meetings before, but we were presenting two posters on finds from Walakpa. At the poster session. Photo courtesy Raphaela Stimmelmayr. One was on the results of the necropsy of a mummified seal found in a 1944 ice cellar. I was excited about it because it was pre-bomb with a pretty tight date and therefore helpful for refining radiocarbon correction factors. It turns out to be the first mummified seal reported from anywhere outside the Dry Valleys of Antarctica! Who knew? The second was presenting some preliminary results of investigations on a polar bear skull which eroded from Walakpa, and was recovered and turned in by Kenneth Brower. It turned out to be somewhat unusual in shape, as well as being really big (maybe the 4th largest ever measured). That bear must have been HUGE! We had been working as fast as we could on the structures at Walakpa. Given how far north we are, “Winter is coming!” pretty much applies as soon as it starts thawing in spring. We had a fair bit of windy weather, so it wasn’t pleasant working conditions, but the ambient temperature was generally above freezing, so the ground remained soft, and we were able to continue excavation. The batteries on the transit were not happy, and we pretty much needed to have one charging at all times, or risk shut-down until we could charge a battery. The batteries are a bit old, and need to be re-celled or replaced, but since I hadn’t expected to be excavating this summer, that was scheduled to happen over the coming winter, which left us a bit handicapped. 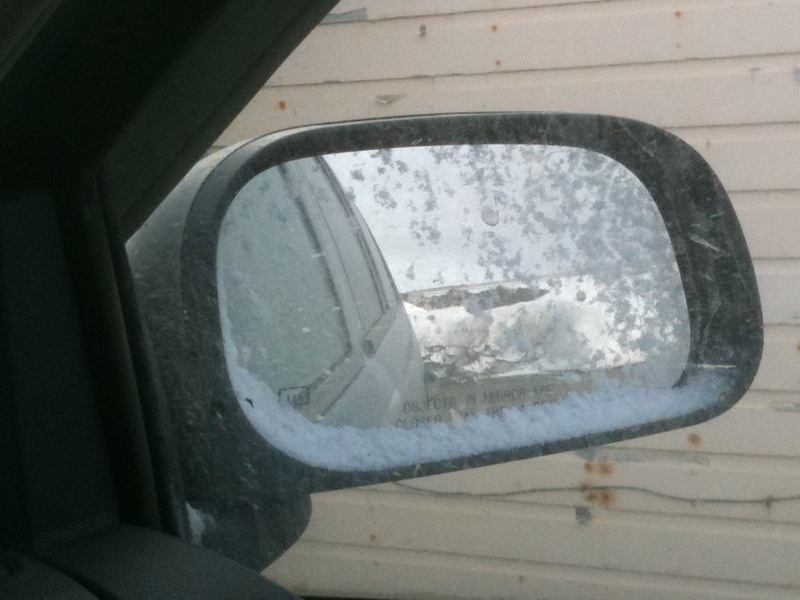 But then, last Monday, there was a dusting of snow on the ground in the morning, and it didn’t melt. Further south in Alaska, snow on the tops of the mountains is often called “Termination Dust” since its appearance signals the beginning of the end of the summer season. And so it was here. 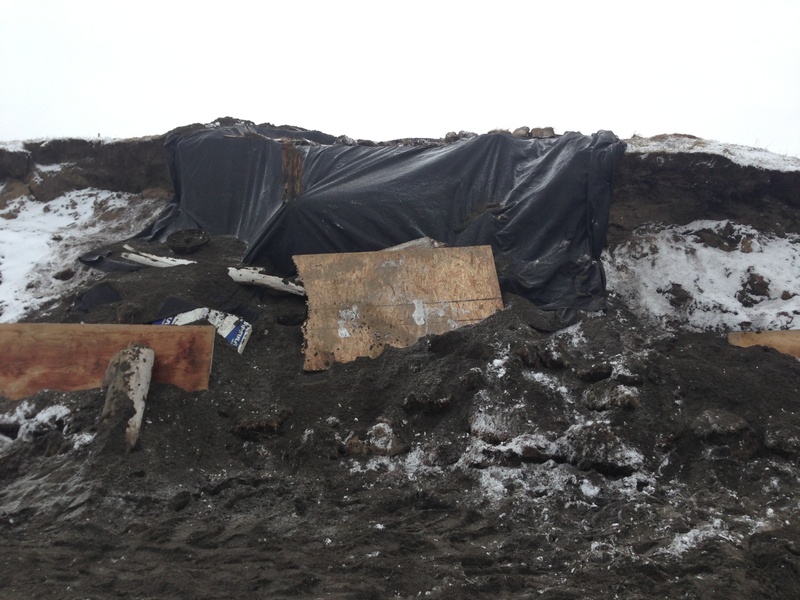 I had started accumulating materials to protect the site over the weekend. UIC Construction had some surplus damaged materials in their yard which would otherwise have just gone to the dump, and they were kind enough to donate them to the cause. Monday, we started hauling them down to Walakpa. 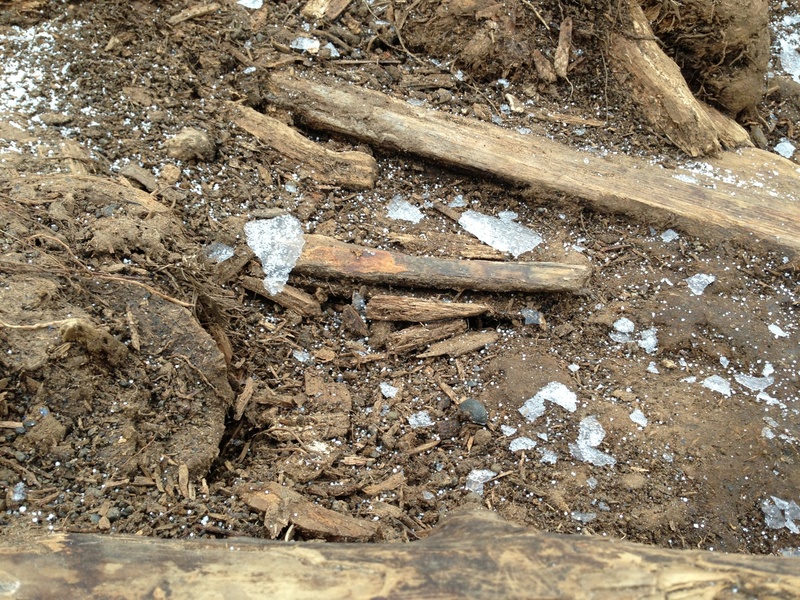 Shards of ice from the tarp after the site was uncovered. We kept digging, since the ground wasn’t frozen. 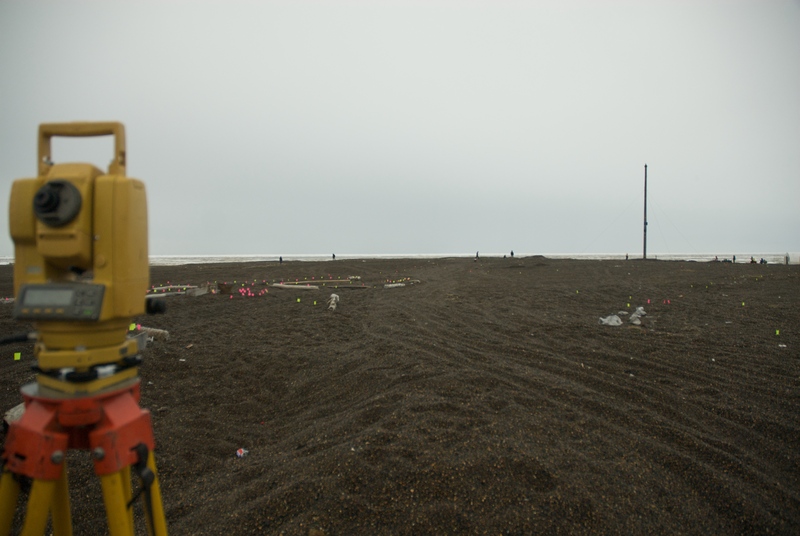 The next morning, there was a lot more snow on the beach, and the ground was really stiff although we did manage to dig a bit more and screen all but two buckets. We met a polar bear on the way down to the site. It was tired, resting on the beach, but was so wary that it got up and moved before we could detour around it so it could rest. More snow on the beach. And a tired polar bear, who was none too happy when we showed up on ATVs. 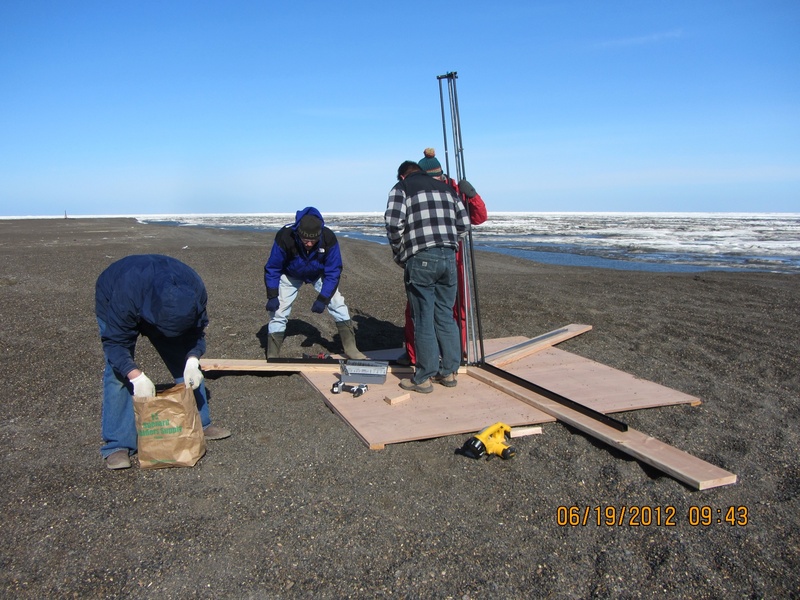 We put particle board along the erosion face of the site, and gathered sods from the beach to stack up to hold them in place. We also used upright driftwood to help hold this in place. 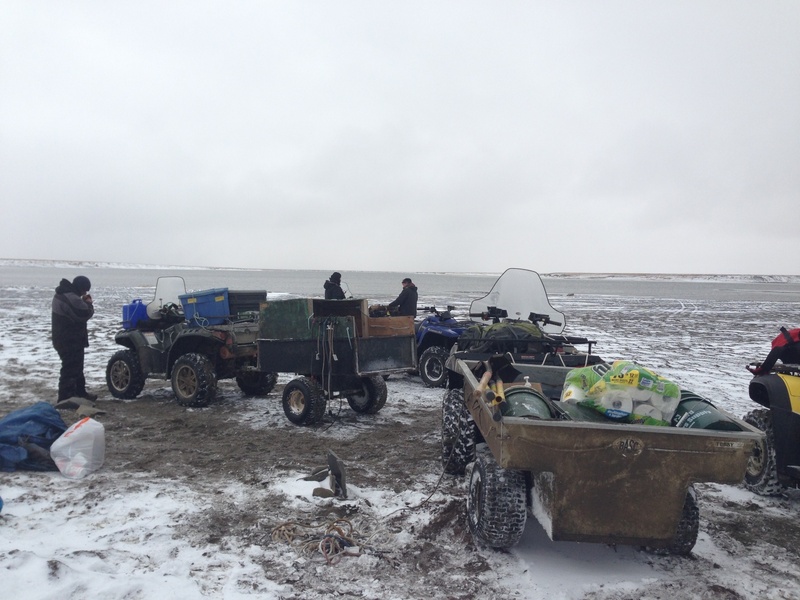 By the end of the day, I concluded that things were freezing to the point where only a pickax would move dirt, which would sort of defeat the purpose of archaeological excavation, so we started hauling gear back to town that night. 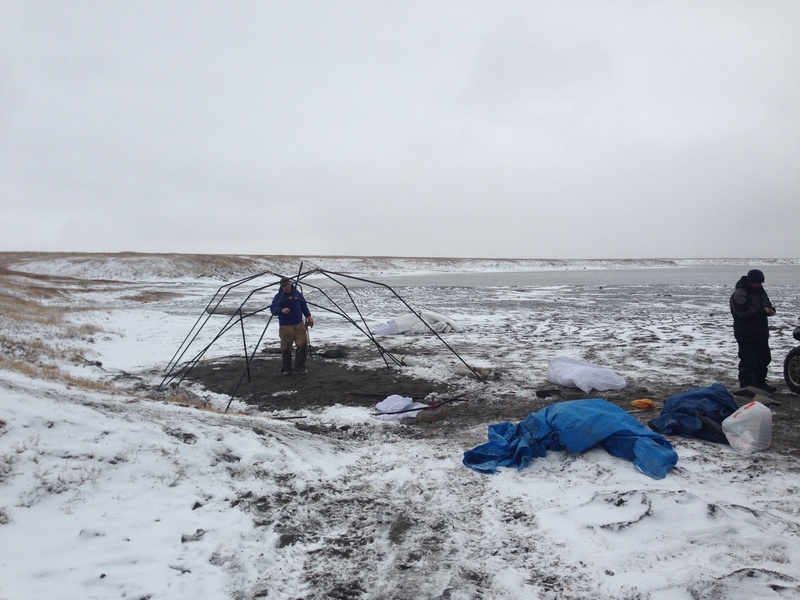 We allowed the site to freeze more the next day, and Thursday we went down to put the site to bed & take down the tent. We put a layer of whiteboard insulation on the top and front of the site, and then covered it with geotextile fabric, fastened in place with spikes. Then we covered that with the original sods which had been saved. Excavation surface covered by whiteboard. 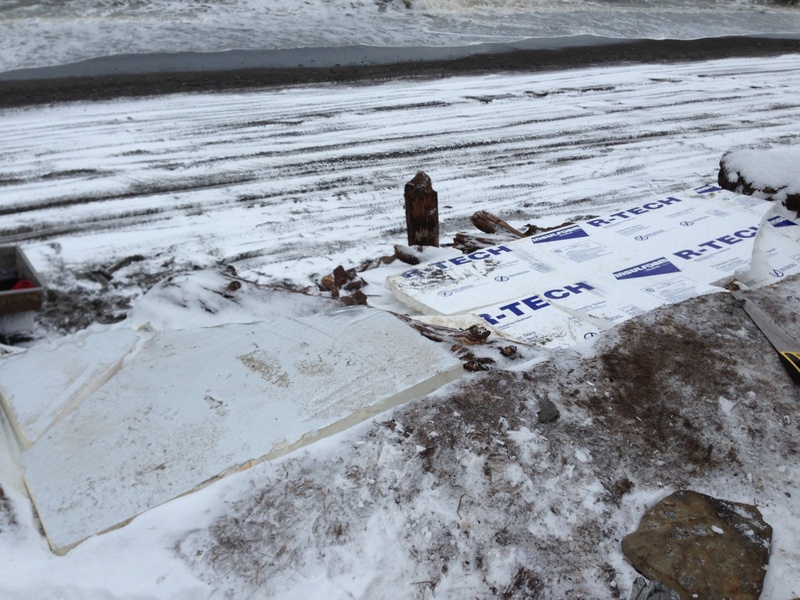 Protecting the site with particle board, geotextile, sod and driftwood. Sod back on the site. Once we had that taken care of, the gear had to be packed up and the tent taken down. We spray painted the hubs of the Arctic Oven frame so the next folks who set it up will have an easier time of it than we did doing it without instructions. Tent & fly are packed and Jason Thomas is disassembling the frame. Packing the trailers. Riley Kalayauk brought his trailer down too, so we had 2. Happy hard-working crew ready to head home. 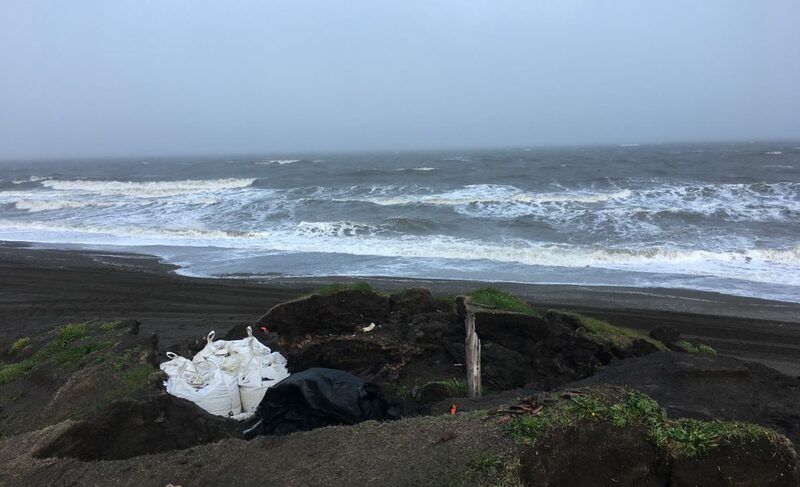 Now all we can do is hope and pray that there are no storms before the ocean freezes up that generate waves big enough to reach the site, and if there are, that they don’t last long enough to destroy the protection that we built. If we are fortunate, it will still be there next year, and we can learn more. We made pretty good progress at Walakpa this week. This, despite a few challenges. On Tuesday, we had a really small crew, due to a variety of circumstances. Only Trina, Mary Beth & I made it out. It was quite a cold day, with ice on the puddles when we got to Walakpa (or Monument). 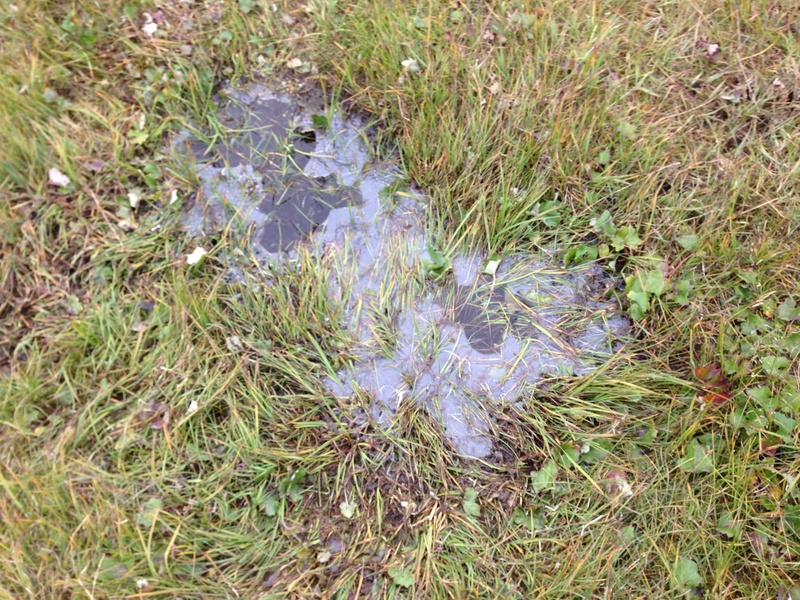 Ice on a tundra pond. We decided to leave the screening for another day and just excavate. It was cold enough that we actually took advantage of the removable floor in the Arctic Oven tent on site and used the Coleman stove inside, but on the ground. 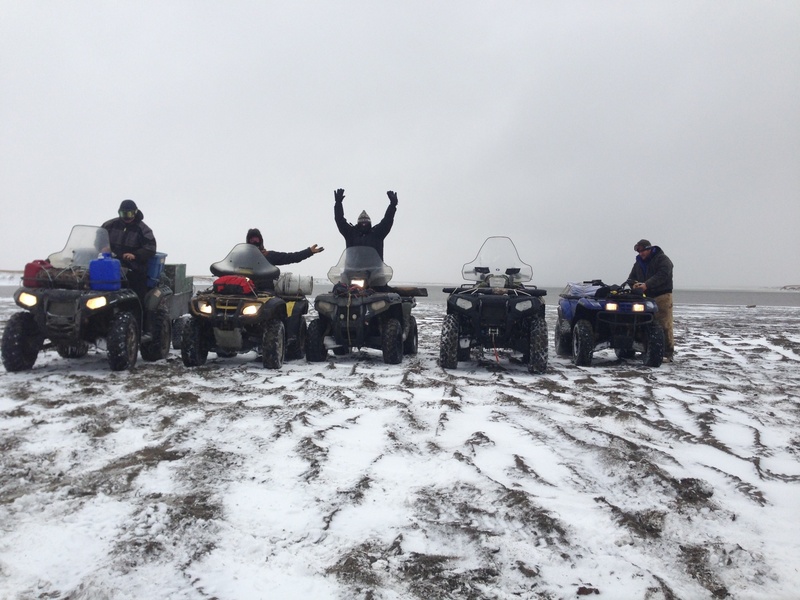 The next morning, we had a bigger crew, but there was snow on the ground when we set off. 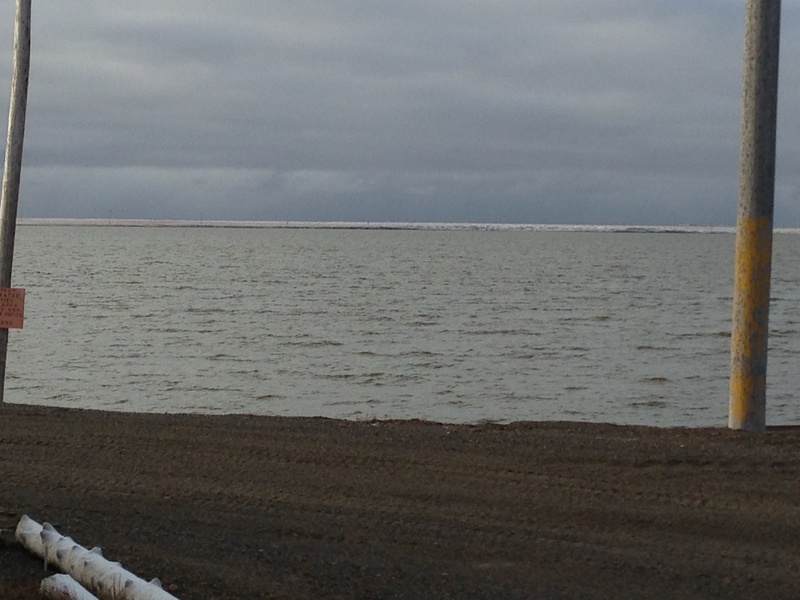 Snow on the tundra, seen across Middle Salt Lagoon. We were not expecting to have a great day, but in fact it was warmer than the day before (no ice), and we started getting down to what seems to be structural wood from the house roof, so that was fairly satisfying. We got a lot of water screening done, as well. The beach had really stabilized, so we were able to go the whole way on hard sand, and even most of the lagoons had closed up, with sandbars across the entrances that we could just drive across. The commute to the site was much quicker. Thursday did not go well. We headed out, only to find that for some reason, the waves were really coming up the beach and running into the lagoons, so that we were not able to get across the stream by the gravel pit. 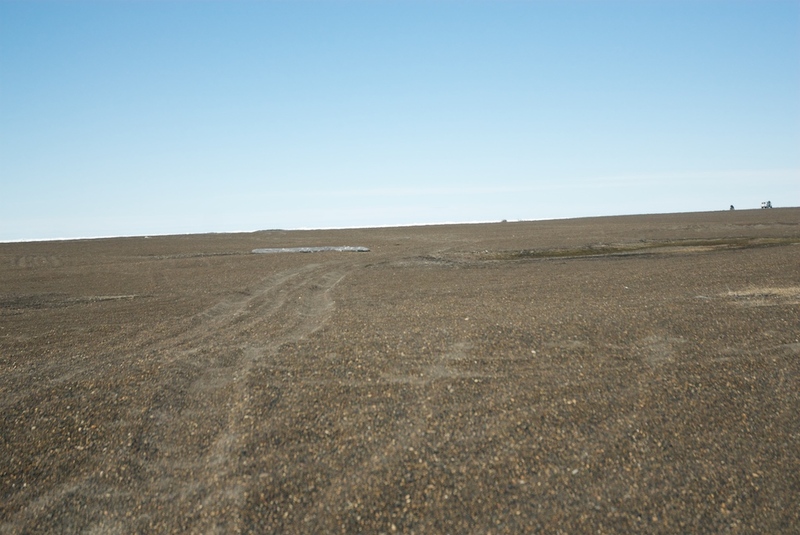 We went around and through the gravel pit, but then could not get across the stream by Nunavak. 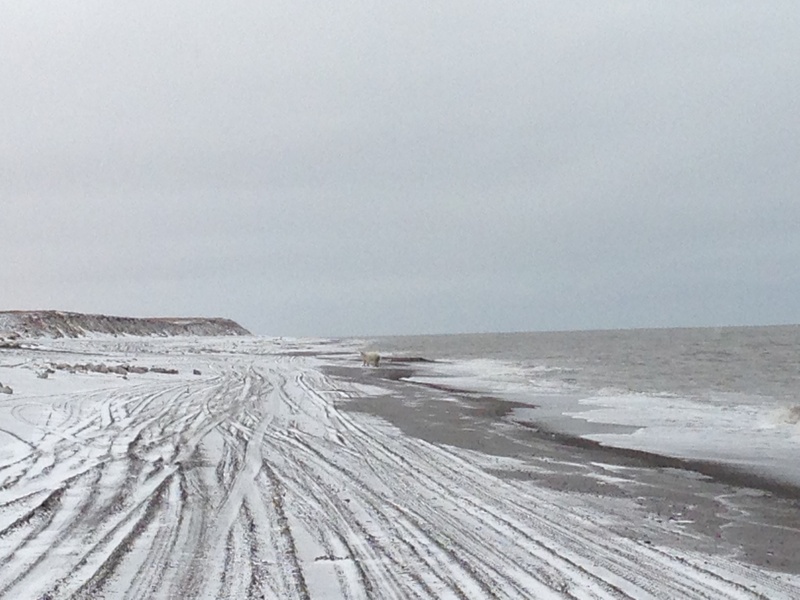 We did see a polar bear in the water near a dead walrus). I decided we should try to go around, since it was otherwise a nice day & I hated to lose it, but we didn’t have any extra gas along, and by the time we were half-way around, even cutting across country rather than following the shoreline, it was clear that some of the Polaris’s are sort of gas hogs. So back we went to the road, with only one minor mishap when the Tubby trailer bounced into a very wet low-centered polygon and dragged the ATV half-way in. I got my feet wet getting it unstuck, but we still went back down to the beach so that David Pettibone could get a picture of the bear, still in the water, from a safe distance. Today, despite no major change in wind strength or direction, was very different. The beach was back to Wednesday’s shape, and we got to the site easily. It was quite sunny in the morning, and we got right to work. 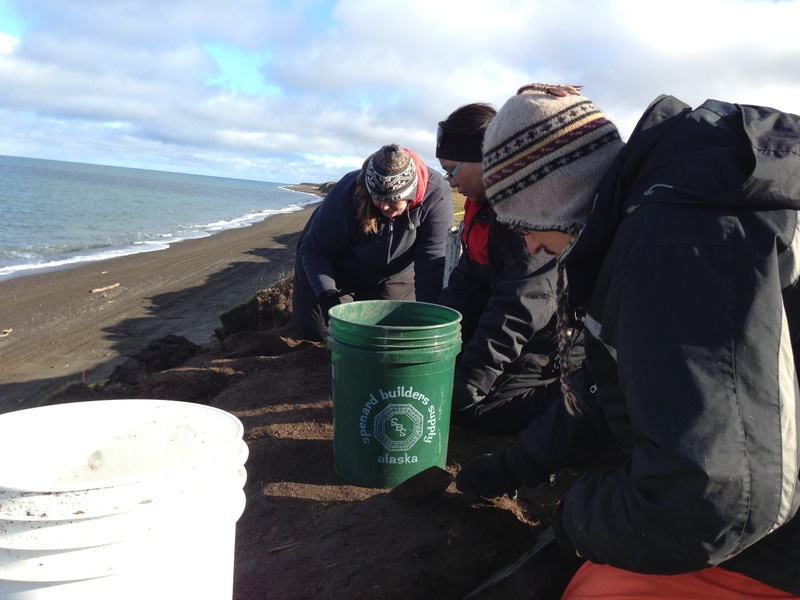 We had six people, so we started with 4 excavating and 2 screening. View from the south end of the trench, where I was digging. Pretty well maxed out. L to R: Mary Beth Timm, JoAnn Akootchook and Michael Berger. I played around with my iPad mini for taking pictures to supplement field notes & drawings. I don’t draw all that well, and used to take Polaroids and draw on them, but that technology is gone and wasn’t that stable anyway. I’ve use a couple of programs to annotate lab photos, but this was the first time I tried it in the field. I used iAnnotate PDF, which lets you put sound files on the image, associated with notes or drawings. They open fine in Acrobat. This will be quite handy. I got out to Nuvuk today for the first time today. 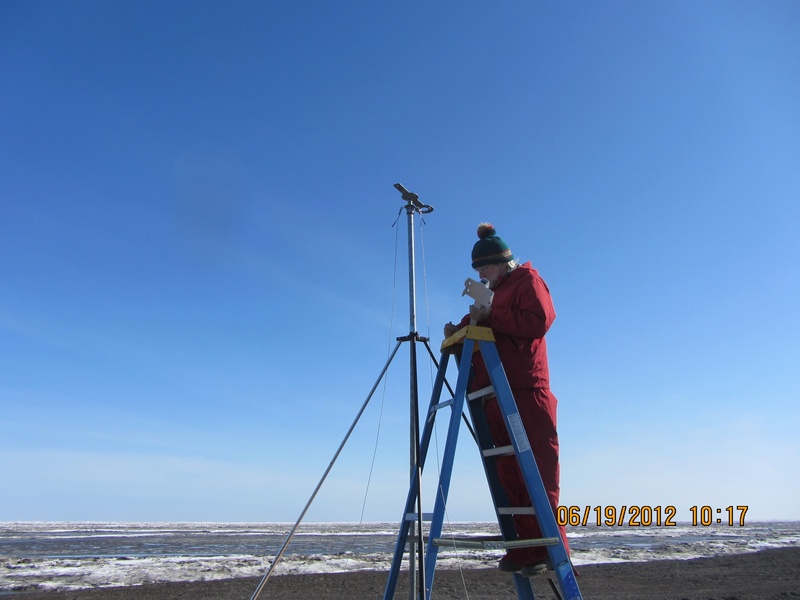 The ARM project that we support want to put a flux tower at the Point to measure flux off the ocean during the open water season. The thing is that the ideal spot for the tower is on the ridge where the Nuvuk site is. In the past, other folks wanted to put flux towers there, but there simply wasn’t room for a tower in an area where we had already tested and recovered all the burials, and we didn’t want to chance disturbance to a burial. 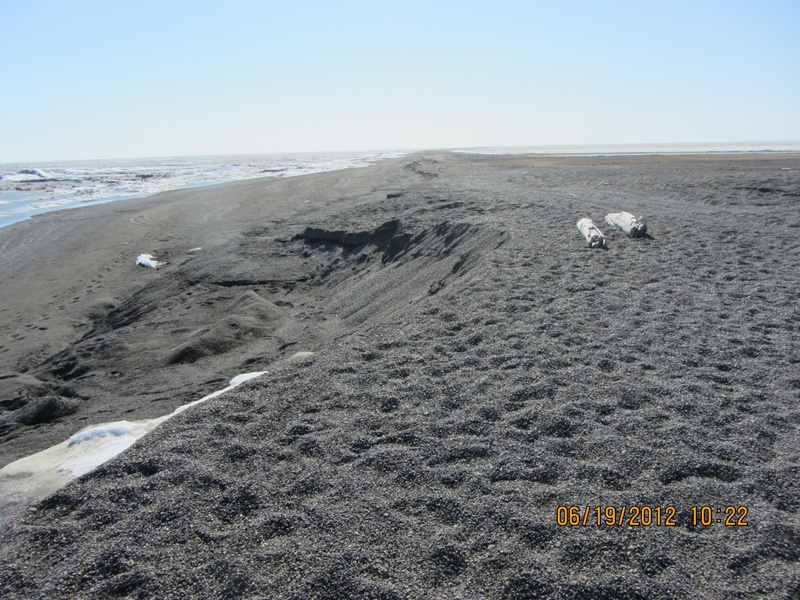 Now we’ve gotten a good way ahead of the erosion, so it seemed that it might be possible. However, I didn’t want the tower to be on top of the possible Ipiutaq structures, just in case funding for their excavation is available. Since the tower installation involved moving a little gravel, it was important for me to be there just in case something showed up. It took a while to get out there, since the ARM Kubota is on tracks and can only go about 15 miles an hour. We quickly got a spot picked for the tower. After that, I spent most of my time looking around for bears while the others started putting the tower together. 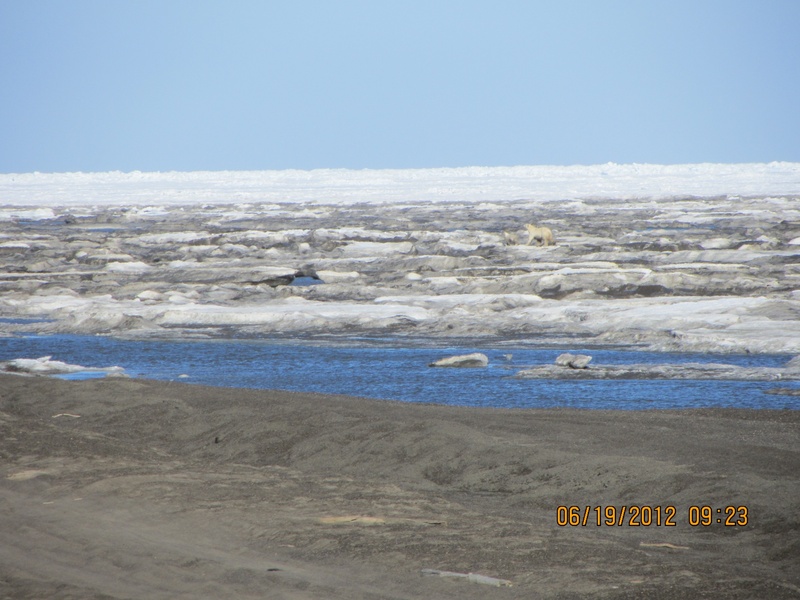 I spotted 2, a mom and a cub, who were heading to the bone pile. Polar bears heading for a meal. Assembling the base for the tower. Putting the instruments on the tower. We decided to use sandbags for the guy-wires and then added some more on top the tracks on the base plate. 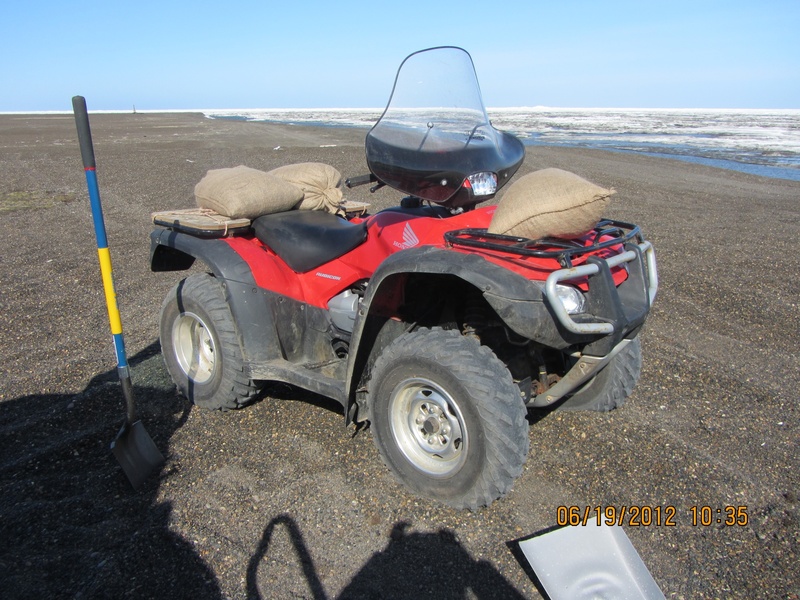 To minimize disturbance to the site, we decided fill the “sand”bags with beach gravel, and bring them up with a four-wheeler. 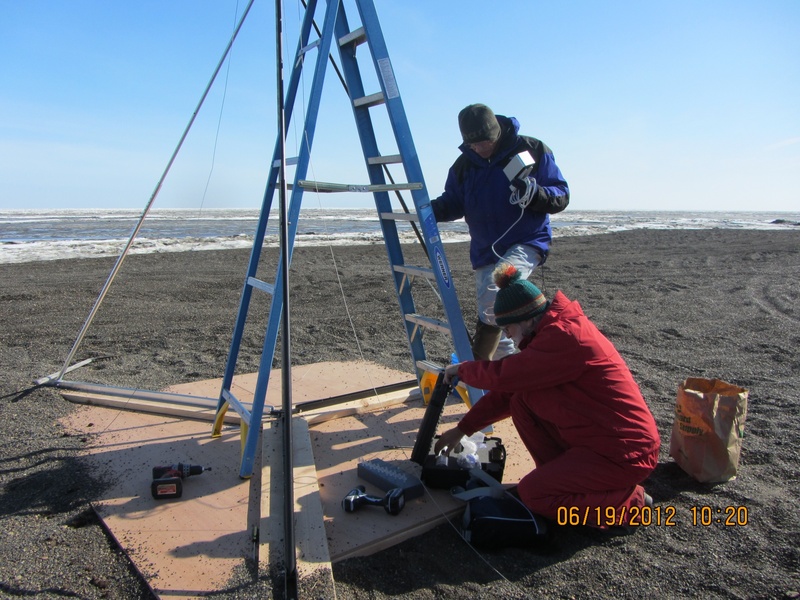 After the tower was assembled and the instruments were on, the instruments needed to be wired up. That took a while, but I had to sick around since one of them needed to look down are gravel, so we needed to cover the plywood base plate, which meant more digging. That gave me time to check out the area where we salvaged the Ipiutak structure last fall. Good thing we did that last fall, because that area is gone. There is a big notch in the bluff there, and that’s it. It would have been a pity to lose that, because we found some very interesting things in the field and in the lab. While I was getting to play, the crew was working away in the lab. 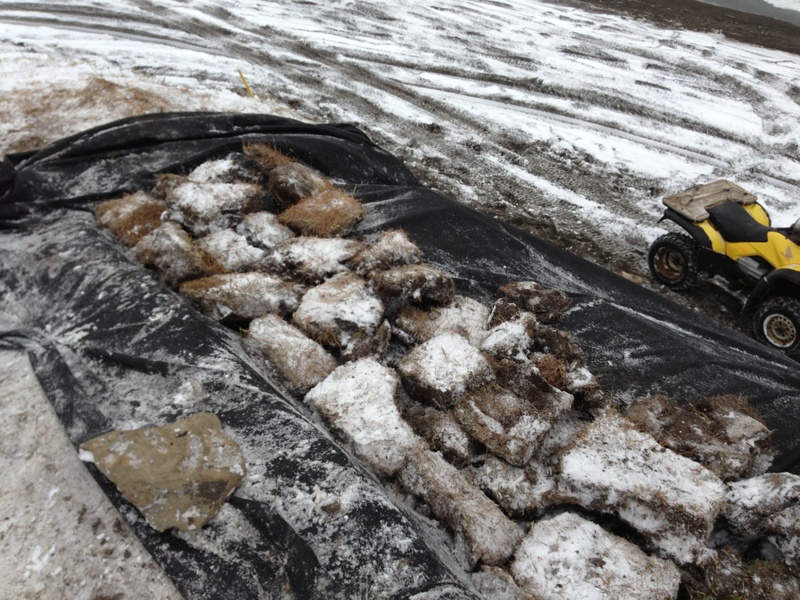 They have finished floating and sorting the materials from the fall salvage, and are moving on. Over the winter, we’ve had several sets of visitors on short notice, which required some materials to be cleaned off benches fairly quickly. As a result, there were a lot of miscellaneous boxes around the lab. The crew has reorganized several cabinets and gotten most of the boxes emptied. There is plenty of bench space, so we are moving on to cataloging and marking. 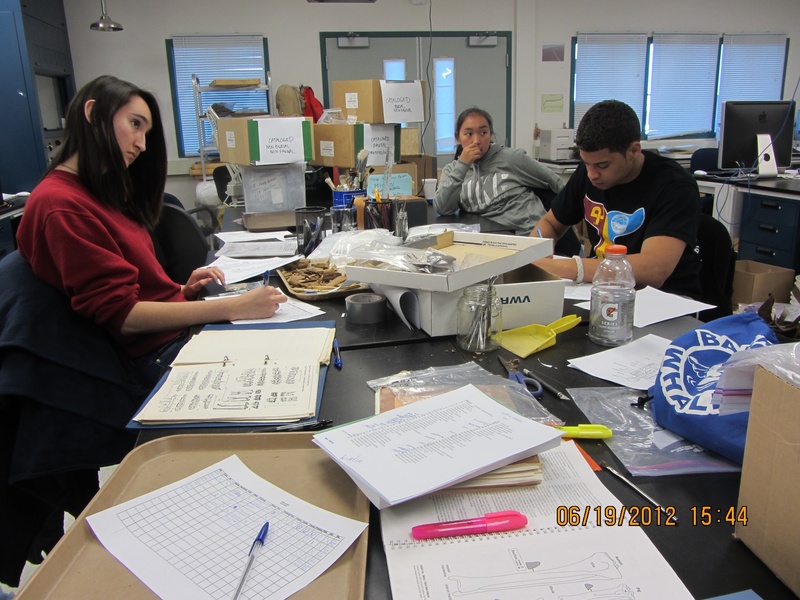 Part of the hard-working lab crew (l. to r. Victoria, Trina & Trace) working on faunal remains. The sun on the breast of the new-fallen snow…. But I went to work and went on about the business of getting travel arrangements made for the crew and ordering field supplies and whatnot. It snowed off and on all day, and was so windy that the crew waiting to install a radar on the roof of the BARC had to call off the lift with the crane due to high winds. Last night the winds were still in the 20+mph range, gusting higher. The surface of the lagoon next to my house, which started to have patches of open water in the warm weather of a couple of weeks ago, were showing some chop, and it was rather grim-looking all around. I spent the morning in a training Webinar for the Alaska Heritage Resource Survey (AHRS) remote web access system, and the first part of the afternoon taking some officials from the US Department of the Interior on a tour of Nuvuk (many thanks to Scott Oyagak for driving us in his truck, because the wind was pretty nasty) and the Nuvuk lab. Apparently one of their staffers had been on a site tour I gave in the last couple seasons and really liked it, so they wanted a tour too. 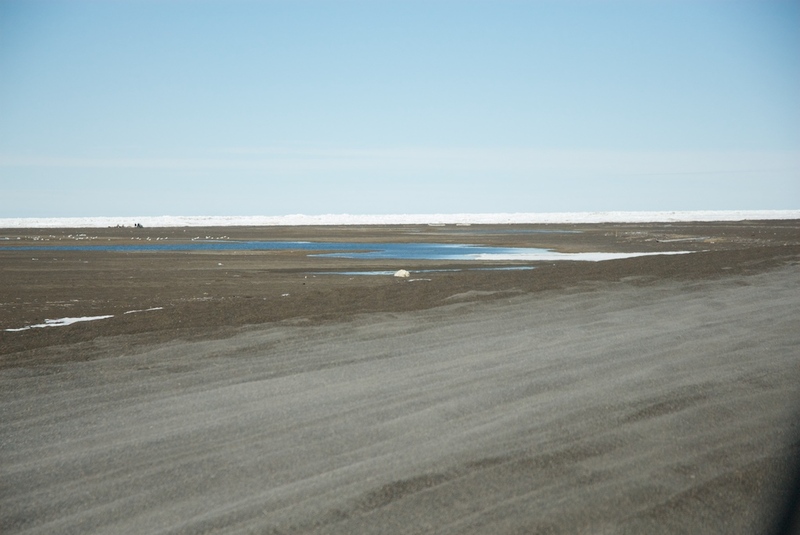 They got to see a lot of ice and gravel, the Birnirk National Historic Landmark (NHL), Nuvuk, Plover Point, and get their pictures taken at the Top of the World, but no bears. I then got to spend the rest of the day dealing with the aftermath of someone having sideswiped the UICS Ranger while it was parked beside the BARC. It was on the passenger side, facing away from the building entrance, and we hadn’t driven it for a couple of days, but there was no dust on the new dent, so it was recent. Looks like someone was backing out of their parking space and hit it. They didn’t bother to leave a note, or call (the truck has decals). Pretty lame. No way they could have done that much damage and not noticed. Fortunately, it seems like they just made a huge dent in the side of the bed, but the door opens fine & it doesn’t seem to have affecting the driving, as far as Tammy could tell on the way to and from the body shop trying to get an estimate. Obviously, I think that archaeology is interesting. In my experience, so do most non-archaeologists I meet. People ask lots of questions, and it’s amazing how many of them say they always wanted to be archaeologists (hey, we take volunteers!). So, I imagine that there’s a reasonable audience for journalism (print, broadcast or Web) that covers it. The Arctic, as the canary in the climatic coal mine and home to endangered charismatic megafauna (AKA polar bears), also seems to be a hot journalistic topic. Given that Barrow is served by at least two jet flights a day and has decent connectivity, we get our fair share of journalists, and a fair number of them want to talk to me. The public pays for most archaeology (and other science) so I think they deserve to hear what they’re paying for us to learn, especially since most people are interested in other people and their doings, as opposed to, say, permafrost or midge hatches, for which the interested audience may be smaller. So I take the time to talk to journalists. I also try to find out a bit about the journalist in question. If I get the sense that they are not very experienced with science or research, I’ll offer to at least check dates and spellings in their story before it goes to print, pointing out that that’s less embarrassing than having to issue corrections of errors later. Some take me up; some don’t. I also take the time to attend panels on working with the media at scientific meetings. They are usually composed of a variety of people who are public information officers for scientific organizations or institutions and science journalists, often quite well-known ones who write for national science magazines or newspapers. They are all very earnest and full of good advice. They are usually amazed at the questions asked by the audience, and horrified by those of us who want to see stories prior to publication. They seem bewildered that the archaeologists making up the audience don’t all see journalists as friends and a great help. Of course, if all journalists were like the ones on the panels, we probably would see them that way. I’ve worked with some great folks. Angelika Franz, a German writer who has done several pieces about Nuvuk, actually has a doctorate in archaeology, so she’s been great to work with, knowing what sorts of information are critical to get right, and understanding technical terms so we can concentrate on the interesting parts of the story. She has done pieces for Spiegel Online Wissenschaft, a magazine called Epoc and now she’s got a book coming out with a number of pieces she’s done. I had great fun being interviewed (in Danish) by some Danish journalists who were retracing Knud Rasmussen’s travels across Arctic America. The story wound up mostly being about the fact that I have a complete set of the 5th Thule Report, in Barrow. 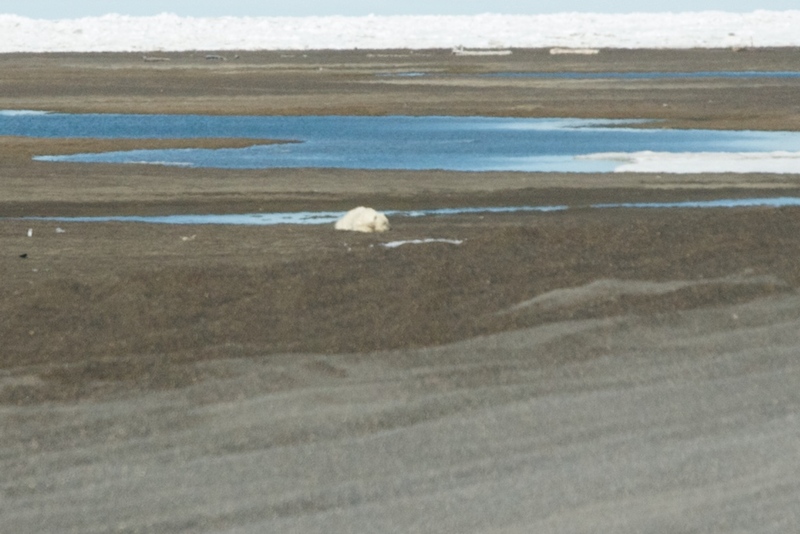 We also had a nice trip to Nuvuk in the local tour van, which resulted in some good polar bear pictures for them. Most of the others have been reasonably competent, and haven’t garbled the stories too much, although they haven’t written stories that answer the sorts of questions people ask me. And then there are the others. There was a group of filmmakers working on video for a major producer of science programming. They had decided to focus on an ice scientist and his (cute female) grad student. 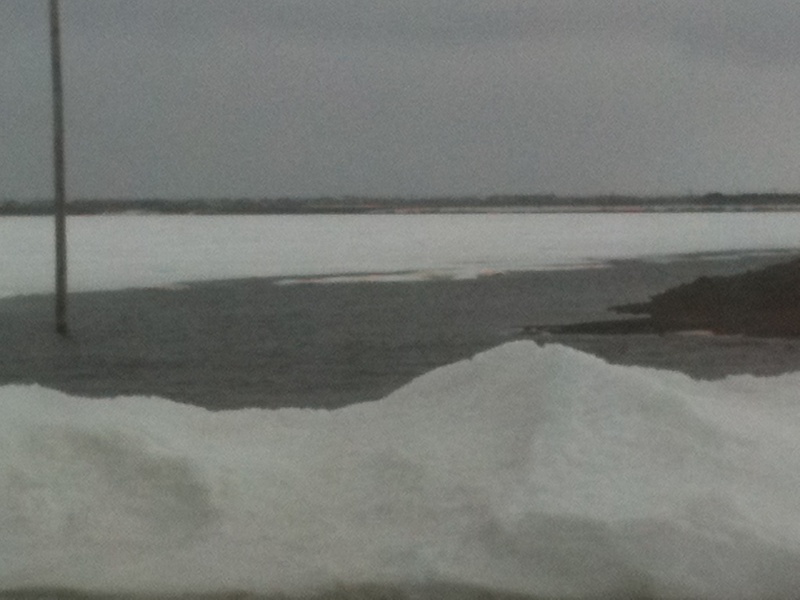 It was spring, so there was not much to see at Nuvuk, but they wanted to go there anyway. They wanted to film them pulling up on snow machines. The tracks aren’t the best thing for the site, but we had already excavated the area near the bluffs, so I said that would be OK there. Of course, they didn’t like the shot, or the light, and wanted to have them coming from a different angle, and retake it, and I kept having to tell them to stay in the cleared area. 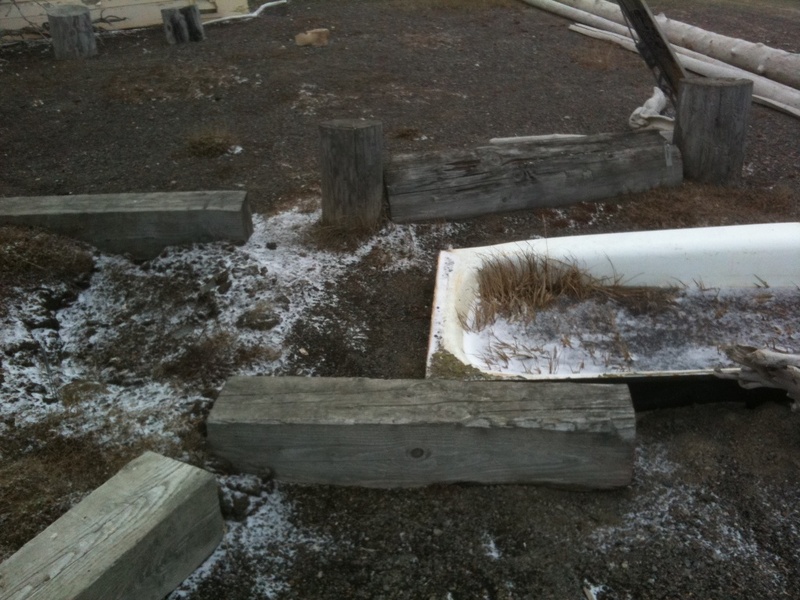 Then they decided that the scientists/protagonists should start scraping away gravel from logs (actually a NARL-era sled shed base) projecting from the bluff, with their mittens. Since this is precisely what we want the public to avoid, it didn’t’ seem like a good idea to show them SCIENTISTS doing it on a reputable science TV series. I pointed that out, to no avail. So I told them I couldn’t be party to that, on film or off, and since they seemed bent on damaging the site, which belonged to my employer, I was going to have to ask them to leave. Better yet was a Barrow reporter for the local newspaper, the Arctic Sounder. The Sounder is not a bad paper given the area it covers and the budget it has. However, I doubt that the editor considers this fellow one of his better hires. He was an odd duck. He once asked me to help him set up the Mac that the paper had given him so that he could file electronically. I got everything set up, and then went to plug the modem into the phone line (this was some years ago). He would not let me. I suggested that we could test it, and then he could plug it in to file and unplug it. No dice. He also thought there was a hole at the North Pole. He interviewed me about some work I had been doing, and in the course of the interview asked me how long people had been in the Barrow area. 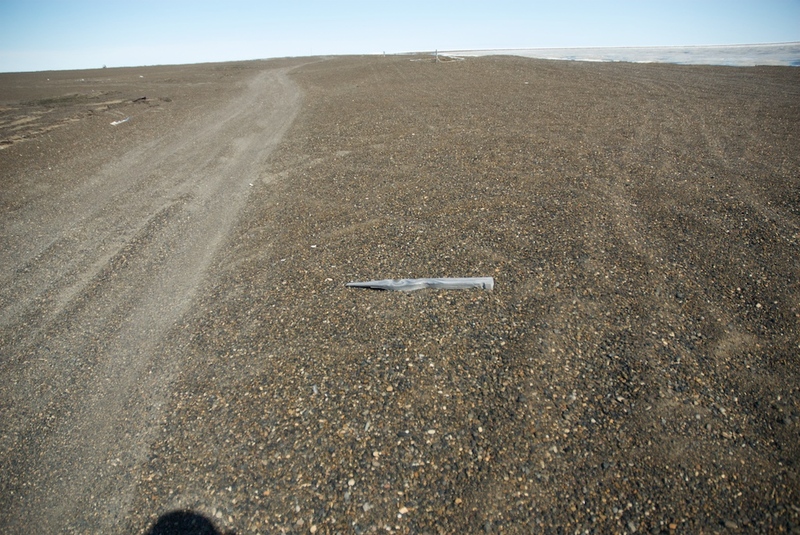 I said it was hard to be sure, since sea levels had risen and between that and erosion the earliest evidence was probably gone, but that there was some Arctic Small Tool Tradition (ASTt) material there, which was probably “4 to 5 thousand years old”. Imagine my surprise at being quoted (in quotation marks, no less) as having said that there were “45,000-year-old Eskimos” in the Barrow area! I got calls from folks as far away as Pennsylvania (Tiger Burch for one) who basically wanted to know if I was off my rocker. When I suggested to the reporter that perhaps a correction was in order, he refused on the grounds that “someday they’ll find 45,000-year-old sites here, and then you’ll have been the first to say it in print.” I have heard, although I can’t confirm, that he was removed from town in a straitjacket. First Day in the Field! As usual, things were a bit disorganized getting ready to go to Nuvuk this morning. However, after rounding up a non-leaking pump, gassing up 5 of the ATVs, buying bungee cords (the many folks who had gotten all the field gear from last year out had somehow not noticed the bungee cords had gone missing), airing up a couple of tires, etc., we set off. After getting to the site and orienting the newbies, we put all the gear into the proper tents, gave the lesson on how to make up a honey bucket that is unlikely to fail in transit (they have to be backhauled to a proper disposal site), and set off in a line, pin flags in hand, to survey the site. 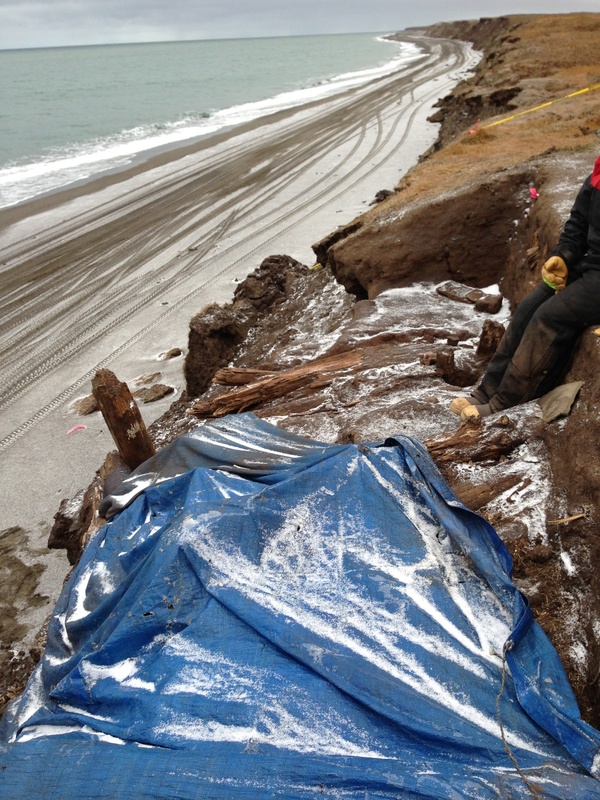 We located one burial during the survey (exposed by recent vehicular traffic, alas) and spent some time getting driftwood to block off and reroute the trail until we can excavate the person. We also located a number of features, and a few loose teeth. Then it was time for lunch. We have a relatively small crew this year, so the tent felt quite roomy. Laura, Flora and Trina get their lunches ready. Trina, Nora & Victoria have lunch in our spacious Weatherport. We took the usual hour for lunch (Rochelle actually caught a nap), and then we went back at it. It started raining, and kept it up until just before clean-up time. Everyone was well dressed, and since the wind was WSW, it wasn’t too cold. The NWS had called for rain or snow, and we’d all be hoping for snow if anything, since it is less wet AND makes for better pictures. Flora and I set up the transit to shoot in the locations of the burial and some artifacts near it. We are moving from the primary datum we have used for many years, because erosion is approaching and we will lose it in the near future. Fortunately, the work we had done last summer setting up paid off and everything went smoothly. We need to mark a couple of the additional datum points tomorrow so they are easier to find. View from transit station over the area we will be working in this season. 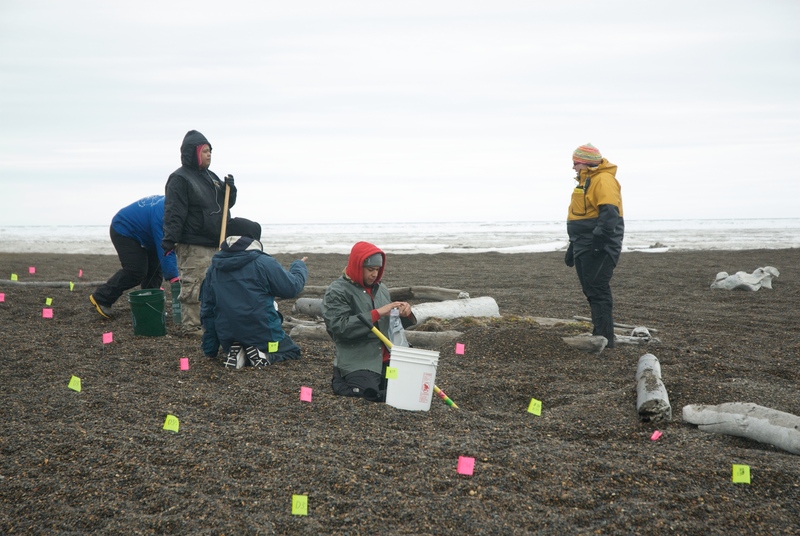 The rest of the crew laid out lines of shovel test pits, and soon Nuvuk was festooned with lines of bright pin flags. We had to dig some of the STPs (shovel test pits) quickly, as they fell on the trail, and we needed to clear that area so people don’t start diverting into untested areas. Part of crew hard at work among the pin flags. Flora shot in the STPs, and Brody backfilled about 20 by himself. Then we packed up, rather quickly for the first day, and headed back in. We didn’t see any bears all day. A couple of hours later, all data is downloaded and backed up, everything is on a charger that needs to be, my houseguest and husband have been fed dinner, and I’m going to bed. Monday afternoon I got to take a quick trip to Nuvuk to check on the two tents BASC had put up for us to use doing the field season. The big one is for lunches and gear storage, and the little one is for the honey bucket (the tour van kept showing up at such awkward times…). It was a nice sunny day, not too windy. Looking northwest across Point Barrow. The horizon is white because of "ice blink" since the ice pack is still in. We even got to see a polar bear. It was sleepy, and just lay there snoozing. There was a van full of tourists snapping away (just out of frame to the right). Blown-up picture of the bear.